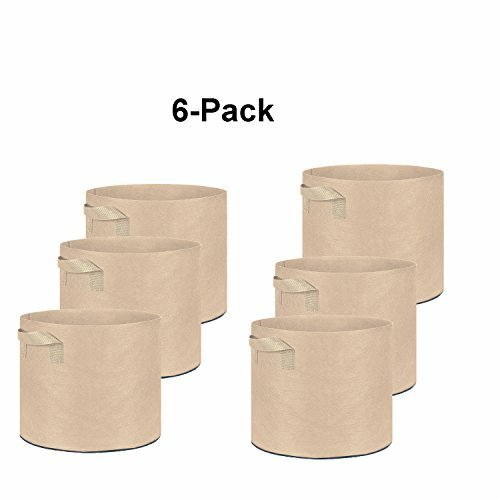 Oppolite 6-Pack 30 Gallon Tan Grow Bags Pots Heavy Duty Fabric Aeration Fabric Pots Grow Bags W/Handles (6, 30 Gallon) by Oppolite at Tulips Orchids. Hurry! Limited time offer. Offer valid only while supplies last. Features: Color: tan Material: Made of thick fabric, reinforced and durable with sturdy handle straps for easier, more secure lifting and moving. Material: Made of thick fabric, reinforced and durable with sturdy handle straps for easier, more secure lifting and moving. ALLOWS YOUR PLANTS GROW FREELY with the necessary space to effectively grow to full capacity, also allows excess heat to escape and prevent damaging heat buildup. PREVENTS ROOTS FROM CIRCLINGP. Decreased risk of transplant shock, Keeps plant warmer in winter and cooler in the summer. BEST Root Pouch (10 GALLON) BEST FABRIC GARDEN GROW BAG CONTAINER (10 PACK). BROWN WITH HANDLES.